I ♥ Motherhood: Galt Toys - Ants in your Pants! 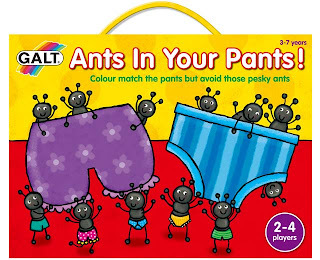 Galt Toys - Ants in your Pants! 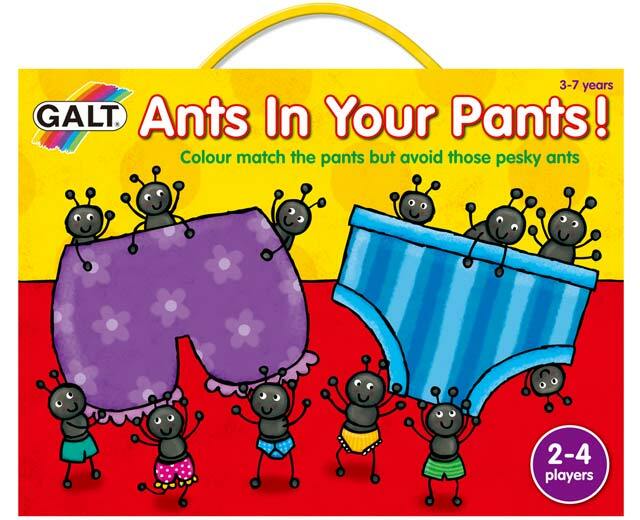 The lovely people at Galt Toys sent us a new game this week, Ant in your Pants and it has been played at least 7 or 8 times today! Wednesday is my day to work from home in the morning until lunchtime so most of the time my mum comes over and looks after Isla while Noah is at nursery. They have some really lovely one on one time together and while I'm working I love being able to hear what they're getting up to downstairs. I was really looking forward to Isla playing this game and thought this morning was the perfect time for it to get trialed. Mum was up for it and so I heard many happy games of Ants in Your Pants this morning! The game is really simple but Isla loved it. There are lots of pairs of different coloured pants and a dice with corresponding colours on it. On the other side of the 'pant' cards there are ants - differing numbers of them and then there are also a few cards with Ant Eaters on them. To win you have to have the highest number of ants. BUT if you get an Ant Eater card then you wipe out your ants and have to start again. Mum said that Isla didn't like the Ant Eaters and she was trying to cheat, refusing to take the Ant Eater card if she chose it! When we played it later she was really funny, making the Ant Eater eat the ants, doing the sound effects. I took a couple of videos of our game, so here you can see it in action. There are a few things I like about this game, there's the colour matching with the dice and the colour of the pants. There's also the opportunity to count up how many ants you have at the end of it. It's also teaching fair play, you have to accept the pitfall of getting an Ant Eater card, it can turn your fortune in the game at any moment. It's such a simple game but I can see that it will get played loads. It's not bulky either so it can go over to the grandparents and it will also come in really handy when we go on holiday to Sand Le Mere! We give this game a big thumbs up. We were sent this game free of charge in exchange for our opinion which I've given honestly. Sunny Weekend & In the Night Garden!